This weekend I was going to play somewhere other than my house, and I intended on using Dungeon Tiles. Now, these things are prone to sliding around a lot on table surfaces, so I came up with a little something I plan on using whenever I take my game to someone elses house. It’s a portable Dungeon Tile playing surface, made out of hardboard and felt, costing me about $6-$7. Home Depot sells a 4′ x 2′ piece of hardboard for around $3. I had them cut it in half, leaving me with two 2×2 pieces. I bought black felt at Wal-Mart for around $2-something. 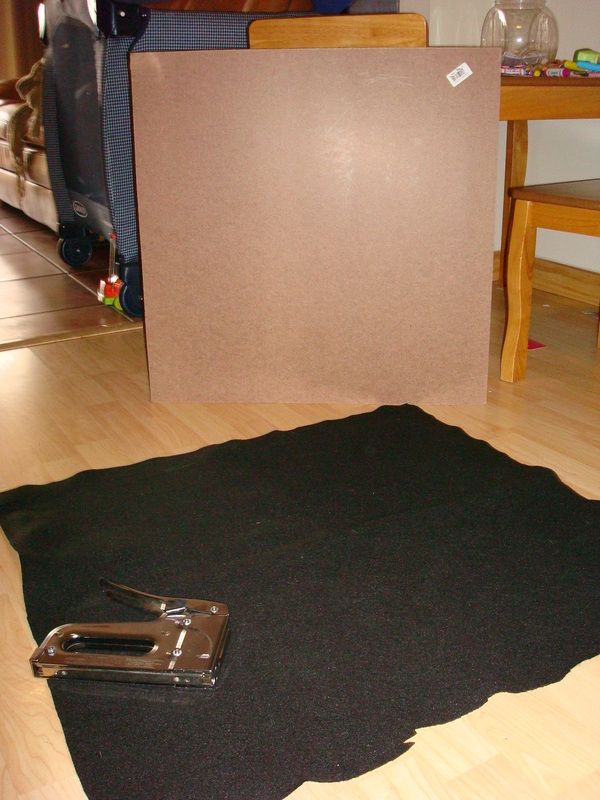 I wrapped the felt around the boards, stapled it, and voila!, nice and big surfaces for your dungeon tiles. The contrast between the tiles and the black felt makes them stand out rather nicely, and the felt also keeps them from sliding around too much. I’m not saying they don’t slide, because they sure do, but the felt lessens this a little bit. You can also add the plastic thingies that Home Depot sells to keep furniture from slipping and scratching the floor to the backside of the boards to protect the table you place these on. 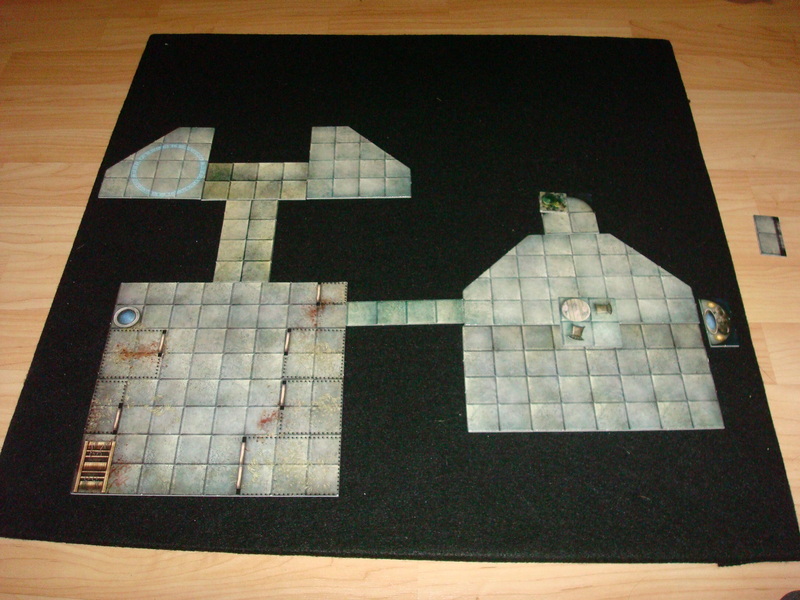 That’s it, a quick and easy solution for when you’re travelling with Dungeon Tiles and need a nice surface for them! I’ve been using blue-tac on black lethrimax board to set the tiles up in advance instead of during play. I have yet to find a surface for the tiles that does not need putty or tape or something to hold them down. The felt is pretty good, but they still slip. The pre-assembling is ideal if your home. On the road it may be a little harder I think. Also, do you hide your rooms from the players and reveal as they move along? Nifty! I hadn’t thought of securing the felt to a board like that. I don’t use the dungeon tiles, but I do something very similar. I taped clear plastic sheeting over a gridded hexboard, so I can draw on it with dry-erase markers. Just add color! It’s light, portable and lets me take a game table anywhere I want to go. @mearls: c’mon, you’re the designer around here! @wicked: how big is the gridded hexboard? what’s it made of? Not bad, Newbie. Thanks! I just picked up my first set of dungeon tiles and was wondering how I could avoid building the map during the session. Great timing. I went to wallmart and found a sheet of gridded foamboard. It’s rigid and about 2′ square. The only issue is that the gridding is 1/2 inch and very lightly , so I used a felt-tip and ruler to darken every second line. I also got the clear sheeting from wally-world. All said, including the dry-erase markers, it cost me $8.00. I use old miniatures and markers from boardgames for tokens and the like. Anybody who says that 4e costs a lot to play is not trying very hard. I also use graph paper to cut out templates for vehicles, like boats or wagons. Works quite well. The only thing to check carefully is the clear plastic. Make sure that you can actually dry-erase off of it, because some types will absorb the dry-erase ink. You can use washable markers for that stuff, but the ink tends to bead after a while, and can get on peoples hands or wipe off while playing. I wonder if the rubber shelf liner rolls would keep the tiles from sliding around? @Milambus: I’ve actually heard they do, and have thought of trying it out.